A New York-based startup called littleBits is putting the basic building blocks of electronics into everyone’s hands—man, woman, or child. It was while working at MIT’s media lab that Ayah Bdeir set her sights on creating a product that would give everyday people the power to be inventors of their own designs. With the creation of littleBits, she is doing just that. Just as LEGO enables kids to build complex structures with very little engineering knowledge, littleBits are small, intuitive blocks that make it a snap to create sophisticated electronics. Each bit consists of a tiny circuit-board with its own specific function (light, sound, sensors, buttons, thresholds, pulse, and motors). 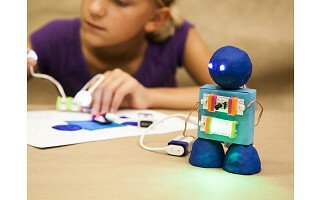 littleBits are color-coded and magnetic making it simple to build large circuits in seconds. No soldering, no wiring, or programming necessary. In combination with everyday materials, littleBits can be transformed into working LEGO bots, clay cars, toy nightlights—you name it, you can create it. You don’t need to be an engineer to light it, push it, turn it, twist it, bend it, buzz it, blink it, or shake it. All it takes is a handful of littleBits and some imagination. We are thrilled to share littleBits with all of you! Our goal is to help make everyone into an inventor, to break down the barriers between the products we consume and the things we make. Feel free to ask any questions you have. Happy creating! A New York-based startup called littleBits is putting the basic building blocks of electronics into everyone’s hands—man, woman, or child. 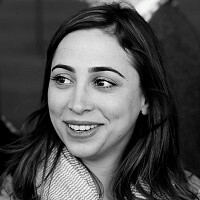 It was while working at MIT’s media lab that Ayah Bdeir set her sights on creating a product that would give everyday people the power to be inventors of their own designs. With the creation of littleBits, she is doing just that. Just as LEGO enables kids to build complex structures with very little engineering knowledge, littleBits are small, intuitive blocks that make it a snap to create sophisticated electronics. Each bit consists of a tiny circuit-board with its own specific function (light, sound, sensors, buttons, thresholds, pulse, and motors). 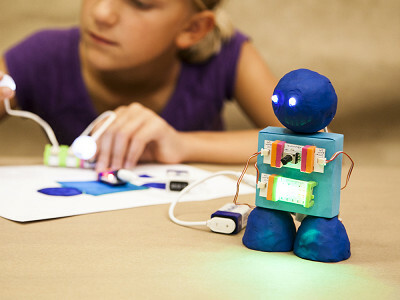 littleBits are color-coded and magnetic making it simple to build large circuits in seconds. No soldering, no wiring, or programming necessary. In combination with everyday materials, littleBits can be transformed into working LEGO bots, clay cars, toy nightlights—you name it, you can create it.